Modify USB auto charger to actually charge a phone! I have always wondered why my phone doesn't really charge from my computer or some car adapters. It stays alive but doesn't charge like it does from my wall adapter. I had always thought it was a matter of the current limit of the devices and cheap chargers. Turns out there is an internal sensor in the phones for detecting if the USB data pins are shorted together that makes the phone decide if it is plugged into an adapter or a USB connector and limits the current. Wow. Wish I knew that years ago after many vain attempts to charge my phone from my computer. I happen to have an Android phone, but these comments apply to Apple devices too. 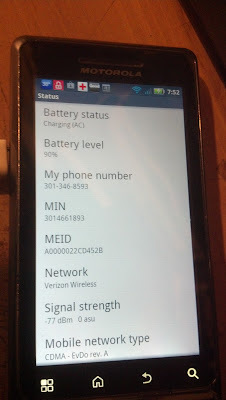 On Android I discovered you can tell what charging mode your phone is in on the Settings->About Phone->Status screen. It will either tell you "Full" , "Discharging", "Charging (AC)" or Charging (USB). When it says Charging(AC), you are in the high current charging mode. When the phone is on, it uses power at almost the same rate that the USB mode charges it, so you never really get anywhere. Based on the reviews and product description of this device, I was lead to believe that it would charge an Android phone at full AC power mode (not USB 0.5amp mode). Based on that information I ordered several of these for a medium-scale deployment of devices at my work. Long story short: This device will not charge an Android device in AC power mode. As soon as you plug it in, the Android device enables USB charging mode. I'm giving it two stars for excellent build quality and packaging. Update: I figured out how to disassemble the unit and it turns out to be quite easy. The high build quality of this unit actually enhances it's ability to be disassembled, modified and reassembled. You can do it all with a single flat-bladed screwdriver (and a soldering iron). Resassembly doesn't require any superglue like some of the other units that are popular to mod. 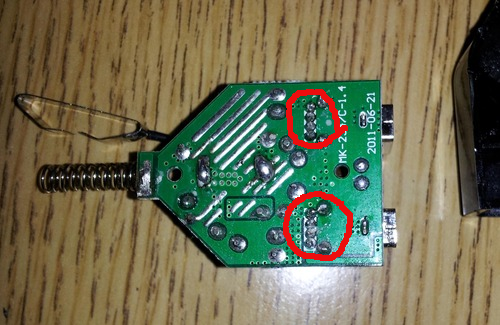 Once the unit was disassembled, I looked on the back of the circuit board and found 2 places where there were 4 small pins in a row. 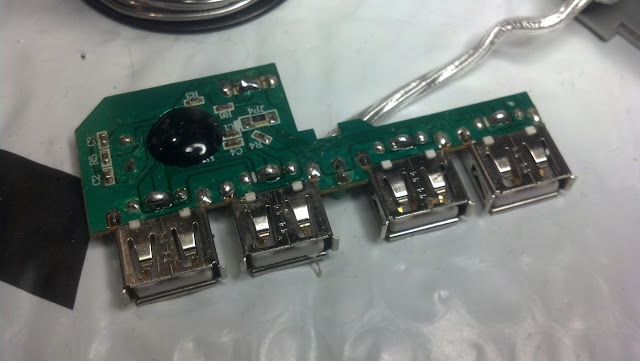 I put a small blob of solder across the middle pins on each of them and reassembled the whole unit. I went out to the car to test it and sure enough, all my android devices see it as an AC charger and start charging in high-speed mode. I will add one star to my rating due to the excellent build quality enabling an easy modification. Thanks to the reviewer, there are even pictures of his mod..
Click on the link above to see his photos. Short the center two pins of the USB connector together for android devices. 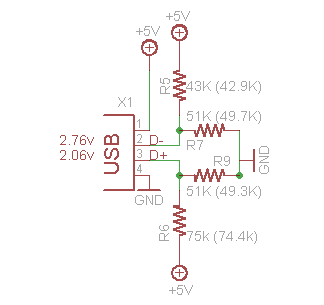 If you apply 5V to vcc+, connect the ground and give same voltage to D- and D+ , the device is going to have AC supply mode. In order to have the same voltage on D- and D+ you have to connect those together (green and white - middle pins on PCB interfaces), BUT YOU HAVE TO LIMIT THE CURRENT through a resistor connected to +Vcc 5V. (over 60K Ohm). So you go from +Vcc 5V, connect a resistor over 60K ohm, and have the other resistor end attached to D- and D+ all connected together. This is excessive. All you need to do is connect D+ and D- together - no need for resistive voltage dividers. 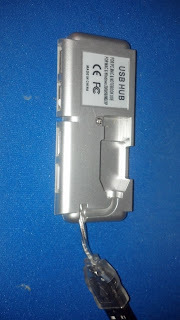 The ONE exception are Samsung Galaxy Tab devices - these expect D+ and D- to be held to 1.2 volts by the charger. 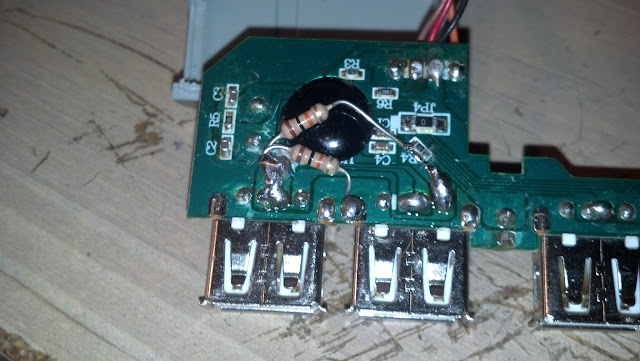 If you use high enough resistor values, you can set up the divider to provide 1.2 volts to a Tab, but easily be overridden by the "short detection" mechanism used by other devices to detect dumb chargers. 33k pullup 10k pulldown is known to work well. Apparently modifying to this circuit will charge an apple device at 1.0 amp. Simply shorting the data pins will work for most other devices. The common mode voltage of the USB conveys the information. OK I've ordered the USB chargers and will post the details of the mod when they come. I'll probably go with the resistors. However I have another idea. I may modify an extension USB cable or my cheap non powered hub to short the D+/D- pins and insert that in the cable. That should trick the phone without modifying the charger. I pulled out a giveaway non powered USB hub that never really worked well in the first place. One screw on the back and it popped open. I will just solder the pins together on the data plugs, which the chip will hate, but this thing should pass power from the charger now. Here is the circuit board on the inside before I modified it. 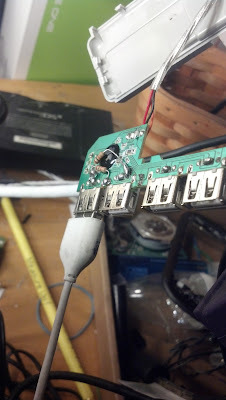 I put a solder blob across the center two data pins in each of the four USB connectors as well as the two for the input cable. I'm not sure that was necessary, but I didn't want the chip to try to communicate to anything, just to pass the power. There are some small resistors on the board in series with the power connections, which may not be able to handle the current. This is just a shameful hack experiment to see what happens. Put it all back together (one screw). FAIL. I tried it in the car and with a house plug and two android phones. Both indicate they are plugged in, to something USB, but none of my phones even indicate they are charging on the status screen. I'm going to have to try a bit harder, either reverse engineering the cheapy USB, adding resistors, etc. I measured the voltage at the D+/D- pins that I had shorted with the solder blobs. ~0V. I also measured resistance and it is not an open circuit. I'm going to have to cut the board traces away from the chip and add a resistor divider. In the mood to hack and learn I committed another atrocity of hacking. I happened to have a couple 1K resistors to make a divider out of. That will mess with USB communication but shouldn't hurt anything. 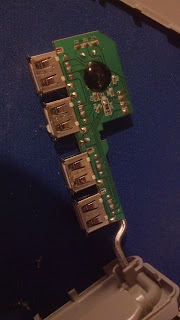 I cut the traces between the chip and one of the USB jacks. I soldered the resistors from the center two shorted connectors, one to ground and one to 5V. I measured with the voltmeter 2.5V on the center two pins. Plugged it into the USB on my computer and into the phone. WIN! The phone now says it is charging in AC mode, when plugged into a USB jack. I'm probably pulling too much current out of the computer so I won't do this long, but it should serve as a handy cheat block to charge my phone faster. Ha Ha, i got the USB car charger in the mail. Either it has been updated, or my phones are less picky, but for me it ALREADY comes up as charging in AC mode. So no modification is necessary. But at least I built a converter for use in other situations.